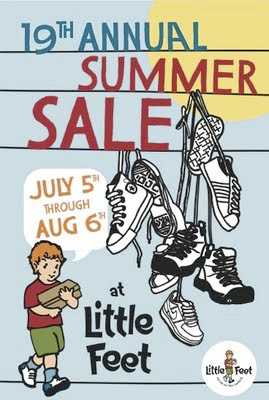 Little Feet is celebrating our 19th Anniversary as a family-owned and operated business in Cherry Creek North! We’ve carved out a reputation for being Denver’s premier Children’s Specialty Footwear Store where 2 generations bring their fit and fashion expertise to children throughout Denver. As we celebrate our 19th Anniversary in July, we’re holding a special event with our Summer Clearance Sale. Starting July 5th and running until August 6th, all merchandise throughout the store will be on Sale for 20% Off, and as we always do, we’ll have 2 bargain tables set up with plenty of pairs of shoes for $20.00 and for $30.00 on those bargain tables. We’ll have our rugged, waterproof sandals from Keen, Teva, and Chaco along with leather and fashion sandals from Kenneth Cole, Twig, Umi, Nina and others. From our sneaker collection we’ll have some of the top name brands including Nike, Reebok, Adidas, New Balance, Converse and Puma. And finally, for kids that are still packing up for camp or vacations we’ve got our outdoor selection from Merrell, Columbia, Timberland, Keen and Teva. Stay up to date with Little Feet on Facebook!